For applications where tethered solutions aren't an option, the 4820 provides the versatility of 2D imaging with the freedom of cordless connectivity. Innovative Battery Technology - Field-replaceable lithium-ion battery enables up to 50,000 reads per full charge. 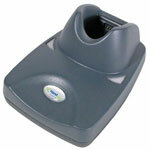 Super-Compact Design - Small footprint enables hands free presentation scanning when docked in the base. 4820HD, Cordless 2D Imager with Disinfectant-ready housing, Scanner only - requires Bluetooth module (Part# Bluetooth) MODULE-KIT) and charge-only cradle (Part# 2020-CB-AE). 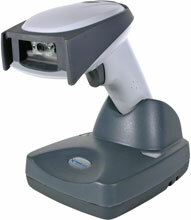 4820HD, Imager only with Disinfectant-ready housing. Order base and cables separately. 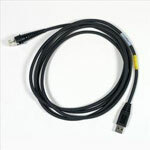 4820HD, USB kit with base, cable, power supply and Disinfectant-ready housing. 4820HD, USB kit with base (charge only), cable, power supply, spare battery, battery sleeve, Disinfectant-ready housing.